Moe Creations: Just Because Blog Hop! Welcome to the Just Because Blog hop!! If you came from Mary's Blog, then your headed in the right direction, if you were just visiting and would like to participate in the hop you may start with Janis. There are only 5 ladies in this hop, so this should be quick and with tons of inspiration!!! Now onto my card I made for the hop, I just think it turned out adorable. I used several dies to make this card, if you would like to see what I used to create it just click on my video and if you like what you see, please subscribe! I am using Cardz TV stamps for my sentiment! I hope you have enjoyed my card, now your off to Cyndi's blog, have fun! I love owls and your card is so cute! OMGOSH.... your card is soooo CUTE! I LOVE the design... but that owl is ADORABLE!! Super cute! I'm so happy I found your blog and youtube channel. I love your owl card and the cards for your sister. Beautiful! Your little owl pirate is just too cute and adorable. What an adorable little sailor owl! Sweet! Your card is adorable! I love it! Thank you for sharing. OMG What a Super Adorable card!! Your Little scene is so cute you so did one Spectacular Creative job!! YOU so ROCK!! 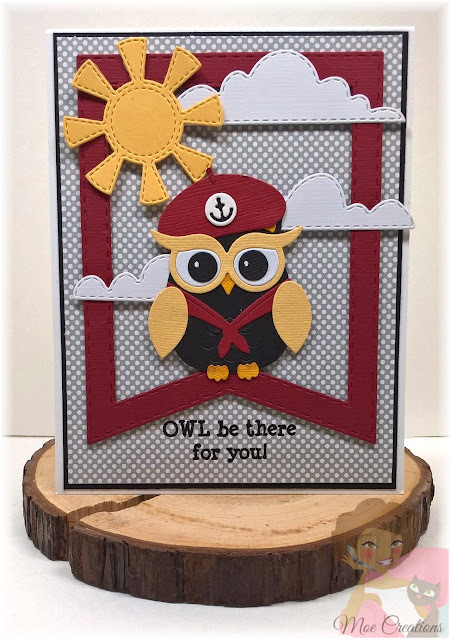 Love your card, the little owl's anchor hat is so cute! Adorable card! I love the layout of your card! Yo, ho, ho! What a cute owl! Glad he's got a sunny day for his adventures. I love your little card. Love your card, that little owl is adorable!!! This is so Super cute!! I love the adorable owl and all of the fun dies you used! !I believe 2 or 3 days ago I became one of your newest Youtube subscriber. Your card is so cute!! you did a great job. Melissa, your card is super cute, and I'm in love with that little owl! So adorable! It's been fun hoppin' with you, my friend! I love your card! Those dies are so cute. I need to find that sun, clouds and banner. Love it!! Thanks for being a part of the hop with us. Hugs! So awesome! 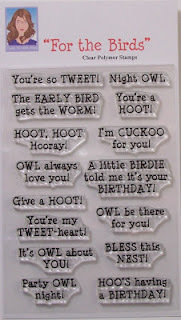 Love that owl and that sentiment set is right up my alley!! Fantastic card! This is just 2 AMAZING! I love your owl ,hes sooo cute!!! I also really like the tag you put under him ,sutle but very,very nice!!! This is so cute. I love the owl. Your card is so adorable, love that owl! Thank you for sharing and for the hop. That is one adorable card. I really love the owl and the colors you used. That owl is so cute and your card is wonderful! Thank you for sharing! Love, love, love this precious owl and the background. Oh how I love owls! Your colors and papers are just super! So cheerful! TFS! Oh my heck.... CUTENESS!!! 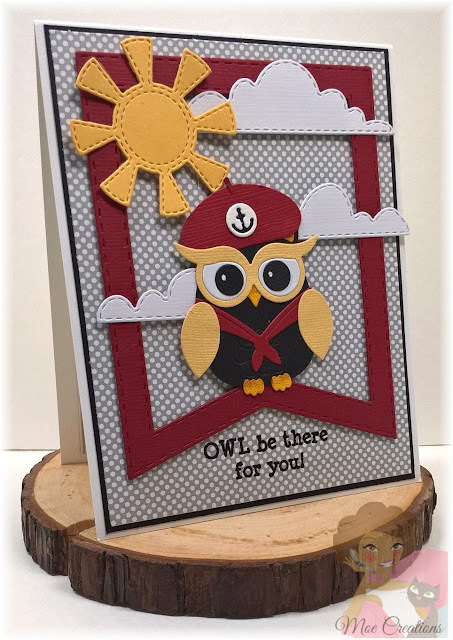 Love that precious owl and all of your die cuts too! Fabulous Fun card! You are so right! This is adorable!! Love the owl. Great card. I like the dies you used and the colors.